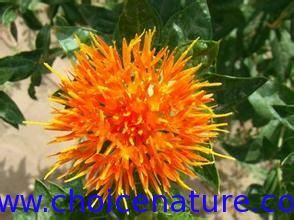 1.Flos Carthami/Safflower is the dried flower of Carthamustinctorius L.(Fam. Eucommiaceae). 2.Action:To activate blood circulation and stimulate menstrual discharge, and to remove blood stasis and relieve pain. 3.Indications: Amenorrhea, dysmenorrhea, retention of lochia, formation of mass in the abdomen, traumatic injuries or sores with swelling and pain.